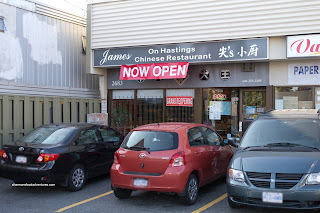 While we were enjoying the Curry Crab at James on Hastings, the owner (James) was really friendly and chatted us up. Admist the conversation, he informed us that they were open for late night "da lang". Oh snap! Perfect for after-hockey-eats on Fridays! This was good news because the options are not good after midnight. Denny's? If you like all of your food in a shade of brown. Knight & Day? If you want all the sauces to look and taste the same (which is not a good thing). No. 9? It's in Richmond! And quite greasy... 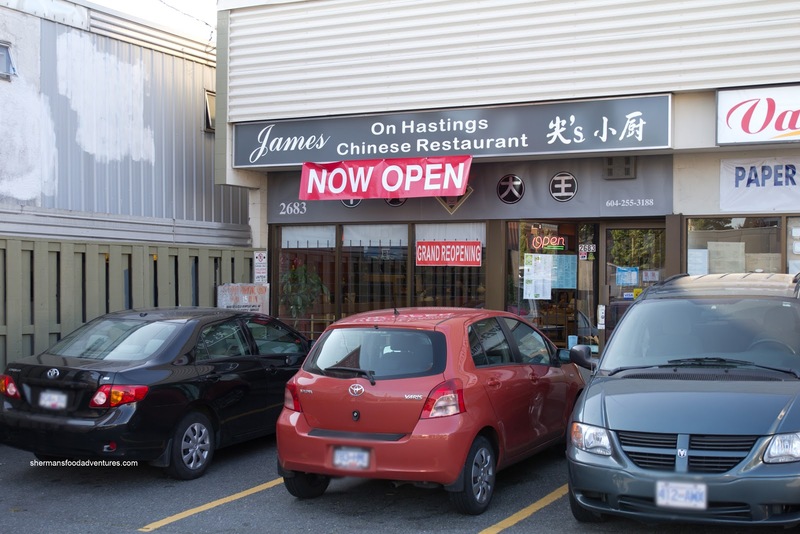 So after another one of our typical 11:00pm games, we headed over the 2nd Narrows to James on Hastings. The insomniac eater's club consisted of myself, Emilicious, Milhouse and Gordo. 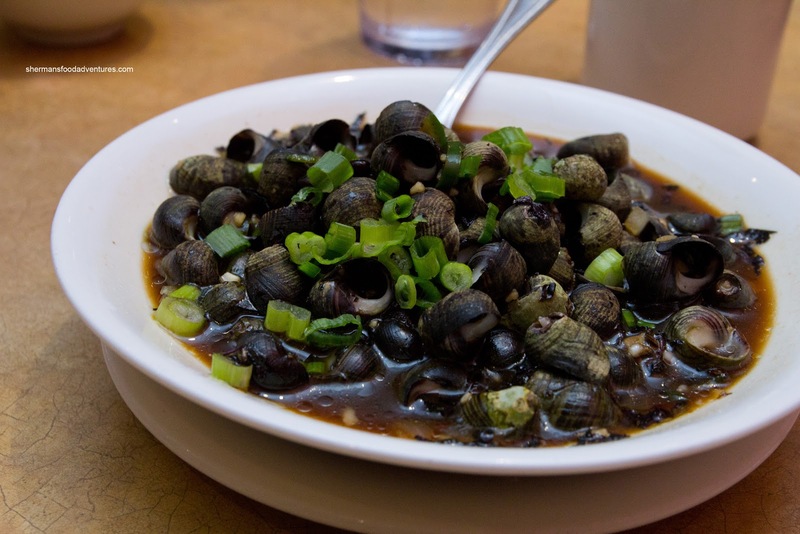 We did go for the "da lang" menu and decided to try out the Black Bean Snails. On paper, it sounded really good (well, to us at least! ), but in the end, these little suckers were hard to eat! Even with toothpicks! But that is not to say they weren't good since there was a decent amount of spice in the sauce while the snails were tender (and not mushy). Of course da lang would not be complete without the Fried Silverfish. Okay, don't freak out. These are not the ones you'd find crawling out from beneath your kitchen cabinets. 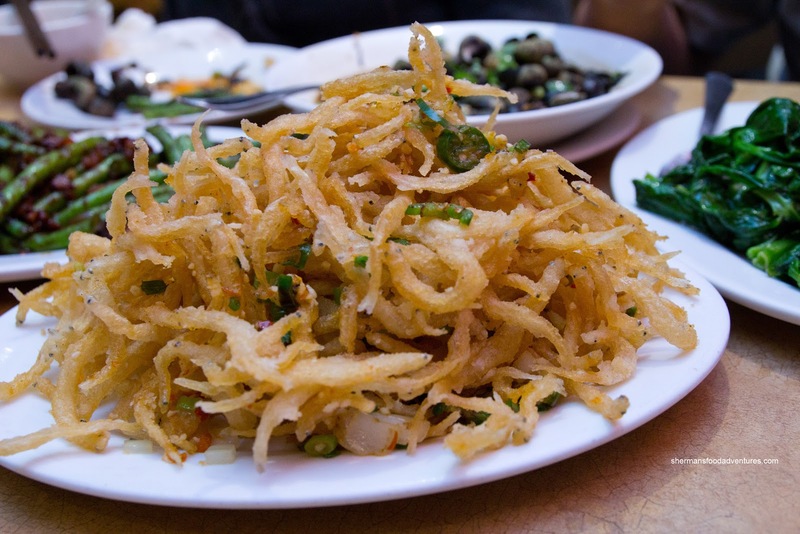 These are actually little fish which are battered, fried, then wok-tossed in salt and chilis. These were good. They were crisp, not overly greasy and full-flavoured. Perfect for the accompanying plain congee (which we got for free since we ordered 6 dishes). 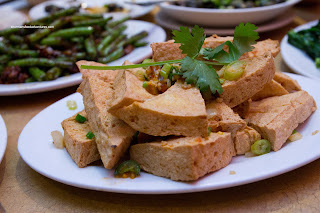 Continuing with the salt and chili theme, we had the Fried Tofu. With the same wok-tossing of spices, there was a good balance of flavours including spice, saltiness and garlic. 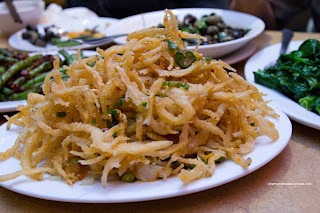 These were fried up crispy, yet a touch stiff. 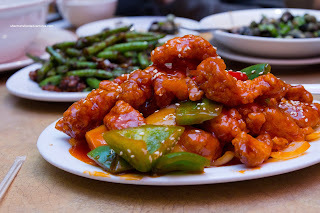 For some reason or another, Milhouse needs to have Sweet & Sour Pork when we do Chinese late night. He is unashamed and unapologetic about it too. Hey, I don't blame him because I like the dish too despite its reputation as a North Americanized Chinese dish. 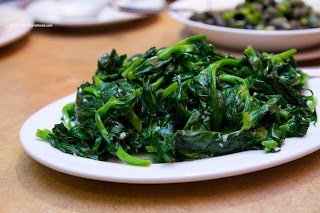 It can be butchered as a dish, but when done right, it doesn't matter if it was eaten at an authentic Chinese restaurant or not. In this case, it was done beautifully right. The chunks of pork were of a good size which ensured they were moist and tender with a crunchy exterior. The fact they weren't overfried helped the cause too. There was just enough sauce which exhibited a nice balance of flavours. 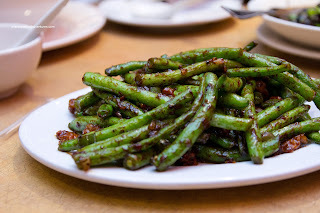 Concerned that we weren't getting any greens in our meal other than the garnish, Emilicious suggested we go for the 4 Seasons Green Beans. We found the beans a touch soft, yet not mushy. There was a tonne of ground pork hidden beneath the beans. This was a very flavourful dish with a hint of spice. If this wasn't enough vegetables, we also got the Stir-Fried Pea Tips. This was a generous portion for a "small" size. As shown in the picture, the pea tips were a vibrant green which was an indicator of the it being cooked just enough. So it was only slightly wilted while maintaining a crunch. Also, there was enough garlic and seasoning to make an impact. Up until this point, we didn't have much to complain about. That changed when we got the Brisket and Daikon Hot Pot. There was nothing amiss with the brisket as there was plenty of it (which was tender). But the daikon had a weird slimy texture and was slightly sour. We couldn't really figure out why, but the owner happily took it back and offered to replace it with something else. 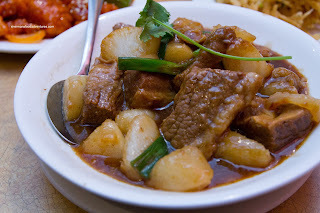 That something else was the Stir-Fried Pork Blood with chives. Yes, kinda gruesome, but don't knock it until you try it. 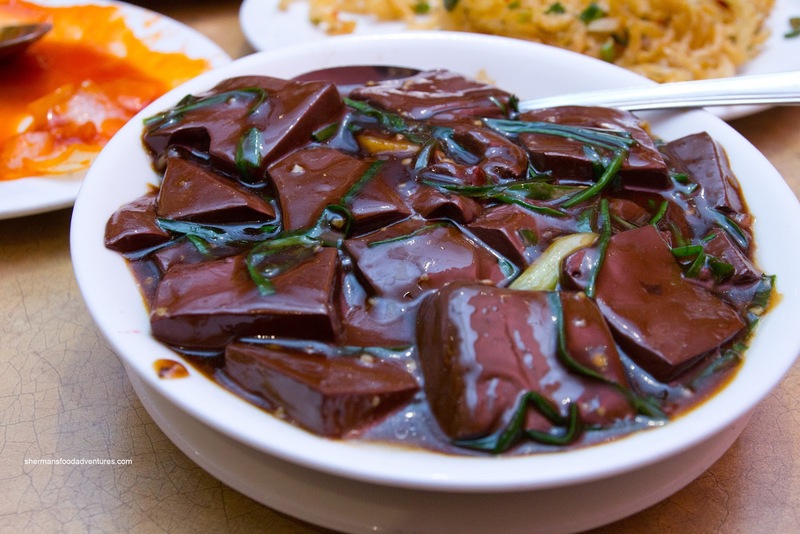 Think of it as slices of soft tofu with a iron-like finish and taste. Okay, that didn't convince you did it? Well, we liked it as the pieces remained intact and they once again, seasoned it enough. So other than the brisket dish, the food was above average and well-portioned. Combined with service that is better than most Chinese restaurants, James is definitely a good option for late night eats.